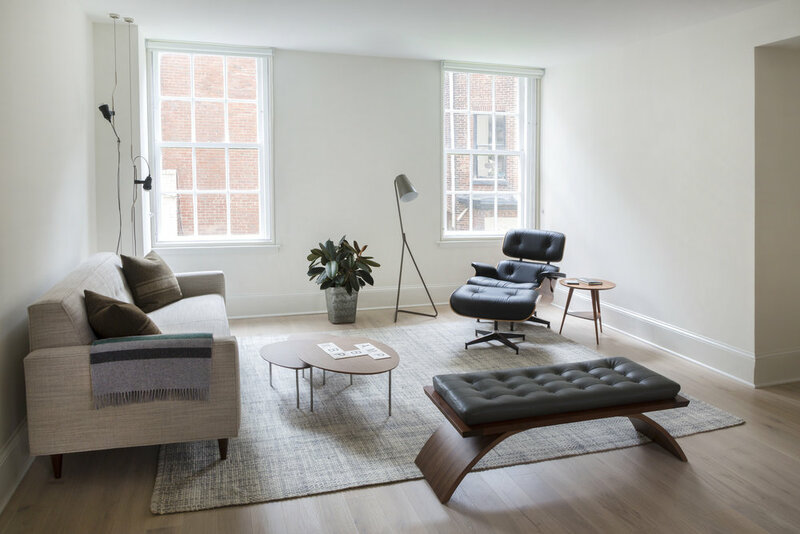 Located right on Rittenhouse Square, this two bedroom condo was the ideal location for our client’s pied-a-terre. While their main home is more traditional in style, they wanted a simpler, modern aesthetic for this retreat. In addition to giving the rooms a fresh look, there were some layout challenges that we wanted to solve (read more and see before photos here). In the kitchen, we removed an island to make room for a dining table. We also used paneled, compact European appliances and installed frameless cabinetry with flush white doors so the kitchen is beautiful without being distracting. In the bathroom, we removed a blocky vanity, rotated the toilet and expanded the room by 6”. 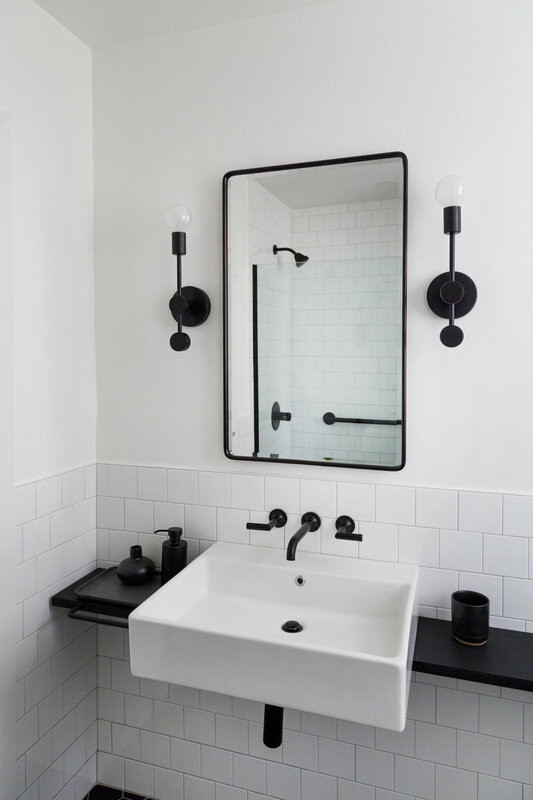 These moves, alongside a custom steel counter with integrated towel bars and a simple black and white scheme by our designer Bronwyn, turned this small bathroom into a showstopper. The apartment got new floors throughout: a white oak in the common spaces and wool carpet in the bedroom and office. Built-in floating shelves in existing niches made better use of these spaces. 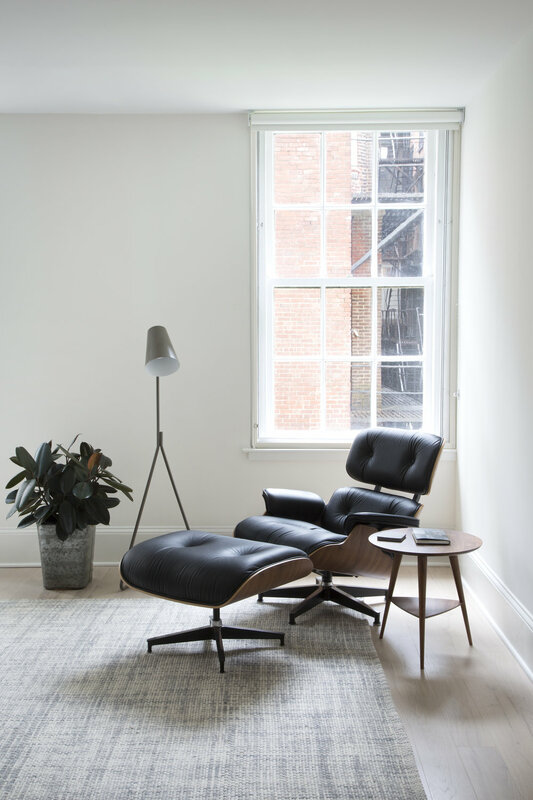 Now our clients have a calming place to get away from their busy lives (and the fennel pretzels at Metropolitan Bakery right out the back door are amazing if they need a snack).